Add some Bohemian flair to your jewelry designs! Learn all of the must-have techniques to effectively and efficiently add fiber to your next jewelry project. Let your jewelry designs stand out by adding leather, cord, silk, ribbon, and more! Add color texture and contrast to your jewelry when you add fibers into the mix. Be inspired by over 100 projects that utilize fiber to create easy-to-wear Bohemian-inspired jewelry with this ultimate collection. Included in this collection is Bohemian-Inspired Jewelry, a book by Lorelei Eurto and Erin Siegel. These two sensational jewelry designers show you how to maximize jewelry-making possibilities by using a simplicity-focused foundation–simple materials, simple techniques, and affordable prices. 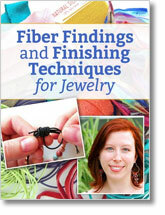 Also included is Erin Siegel's webinar Fiber Findings & Finishing Techniques for Jewelry, in which she'll teach you all the material information you'll need to know to successfully incorporate fibers to your jewelry using findings, wire, knots, and more. You'll also find in this collection Leather Jewelry, a special publication that will make you fall in love with creating leather jewelry. 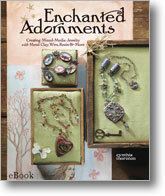 We've also included Chinthia Thornton's Enchanted Adornments, a fantasy fariytale of wire, plymer clay, resin, and more. Finally, we've rounded out the collection with an exclusive materials kit from Ornamentea you can get started immediately. You won't want to miss out on this ultimate collection featuring must-have supplies and step-by-step instruction for ONLY $49.99! Hurry, time supplies are limited! Discover 50 beautiful designs that explore the use of cords and ribbon in jewelry design. This book is perfect for all levels of jewelry makers with projects that range from basic jewelry-making techniques, including stringing, knotting, and wire-wrapping, to more advanced processes, including knotted loops and button clasps. 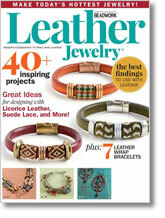 Be on top of the leather trend with this special issue that features 100 pages filled with over 40 projects ranging from something you can make in less than 15 minutes to more challenging beadweaving designs. You are sure to find a special project you can't wait to make and wear! Plus, gain insights that will help you choose the proper findings and use the best tools for each project. Enter the fantasy fairytale world of Green Girl Studios, where every charm has a story and each piece of jewelry is filled with magic. Jewelry artist Cynthia Thornton combines her love of storytelling with a wide variety of innovative jewelry techniques in this book meant to teach unexpected ways to create unique pieces infused with personal meaning. Join jewelry artist and author Erin Siegel for this on-demand web seminar dedicated to teaching you how to successfully finish beautiful Bohemian-inspired jewelry projects! 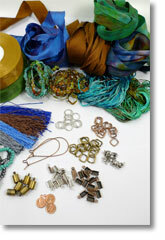 Add visual impact, color, texture, and contrast to your jewelry with the addition of fibers in your jewelry designs. Add fiber and fabric to your jewelry with this kit hand-picked by Cynthia Deis at Ornamentea. Each kit is unique, so your one-of-a-kind package will include a mix of materials in an array beautifully earthy hues. 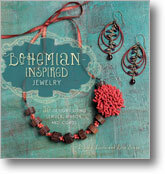 * Book "Bohemian-Inspired Jewelry" was GREAT. * Magazine "Leather Jewelry" was GOOD. * Package of materials was POOR; much of boho jewelry is leather and there was no leather, just dainty and fragile little ribbon bits and some OK findings. * Download seminar was slides with a woman reading the words. I wanted someone to show me how to attach multiple strands of leather to a finding. * Download of ebook "Creating Mixed-Media Jewelry with Metal Clay, Resin & More" was OK. Many specialized materials needed and although great layout, kind of airy fairy.